Your day trip starts with the drive east of Perth to historical York, the first town founded in the Avon Valley. Stop here to enjoy morning tea in town (own expense) before continuing to Hyden, pausing along the way at a dog cemetery in honor of working Australian sheepdogs. In Hyden, check out Hippo’s Yawn, a rock formation that resembles a yawning hippopotamus, and then sit down to an Aussie Country-Style lunch. 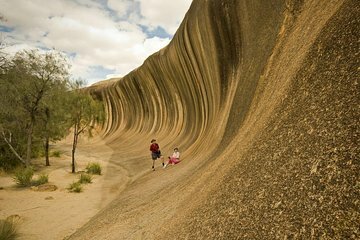 After eating, make the drive to Wave Rock, one of Western Australia’s most popular natural landmarks, a 50-foot-tall (15-meter) rock formation that resembles a giant ocean wave. Also in this area, see the ancient Gnamma Holes, a sacred Aboriginal site, and choose to visit a wildlife park or check out the Antique Lace Collection. Next, head to Mulka’s Cave, a large boulder with a hollowed-out, cave-like shape, and the Humps, a granite formation. Then start the drive back to Perth, taking a different route that includes a stop in the country town of Babakin for afternoon tea (own expense). If you’re taking this tour during wildflower season (typically September to November), you’ll make stops during the day for views and photo opportunities of Western Australia’s renowned wildflowers. Your day trip ends when you arrive back in Perth in the late evening. Long old drive but worth it when you arrive! This was an amazing day the journey took us through a number of differing areas all of which were very different and interesting. Our driver was very knowledgeable. The Aboriginal Cave we visited and the information about it was fascinating. Wave rock was stunning from every angle and well worth the long drive there! the only thing missing were the wild flowers - we saw a few but not the hoped for carpet. However our driver knew much about the habitats we passed and told us a lot about the different shrubs and trees we saw. A great - if long - day out! A long day, but expected on this type of tour. A couple of stops along the way to break up the journey. Some interesting places visited and cool to see the Wave Rock formation from both below and above. Our driver was Mark and he was very friendly and had lots of knowledge about the area. Would recommend. This tour is a worthwhile trip despite the long travel. It is operated by ADAMS pinnacle tour with a very good guide Mark who explain in detail the geology, the history and culture of the region. Worth a trip. The Wave Rock is amazing and the visit to the nearby Aboriginal cave was also interesting. It is a long day with much driviving. I would choose this trip over the Pinnacles if I had to choose one. Wave Rock Cafe's better improve their catering. Some insipid chicken pieces in overly sweet red sauce and shredded cabbage makes a lousy lunch. The Wave Rock was a great sight. This was an interesting day, but with a LOT of time in the coach. Our driver, Grant, provided interesting commentary as we drove through the wheatbelt. York was a nice tea stop. The dog cemetery was short and sweet. Lunch, Wave Rock and Hippo's Yawn are within a few km of each other. The only way to do the lace museum or wildlife park is at own expense during lunch stop. Mulka's cave is only a short drive from 3 stops in Hyden. Then a long drive back with a quick dinner stop in Brookton. The hotel pick up is convenient,but adds a half hour to the day. We clocked over 13 hours, and would have been longer if the wildflowers had cooperated. Ideal for those seeking a non-active day.